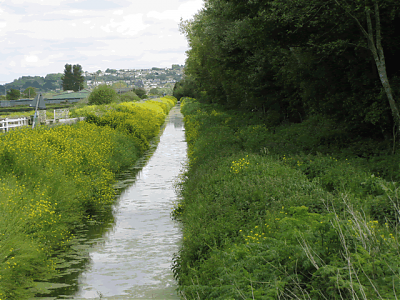 The Glastonbury Canal ran for just over 14 miles (23 km) through two locks from Glastonbury to Highbridge in Somerset, England, where it entered the River Parrett and from there the Bristol Channel. The canal was authorised by Parliament in 1827 and opened in 1834. It was operated by The Glastonbury Navigation & Canal Company. Most of it was abandoned as a navigation in 1854, when a railway was built along the towpath. The Canal Today : The seaward end from Highbridge to Bason Bridge is the River Brue, much of the rest of the route has been incorporated into the South Drain. Small boats are able to pass from Highbridge to Glastonbury. For a full selection of images for this canal visit the canals Image Gallery. . Here you can read Joseph Priestly's 1831 description of the Glastonbury Navigation from his Historical Account of the Navigable Rivers and Canals and Railways of Great Britain.